Get ready for excess. You’ll leave feeling like a glutton, or if you’re a foie gras lover, marvel at how one menu can contain so many renditions of a fatty goose liver. 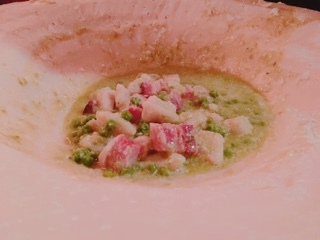 Au Pied de Cochon has been covered so intensively that if you go expecting a light salad, you must be living under a rock. With that in mind, I steeled myself for a rich dinner, albeit one that doesn’t include the fatty liver and their duck in a can. Even though their menu isn’t a “small” plate format, it certainly lends itself for sharing. Trust me, the portions are huge and each dish so heavy that you’ll need a helping hand. 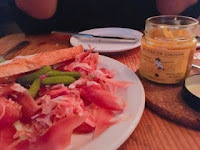 Take their cured ham from the shack ($16), the wispy slices of fragrant salty meat delicious, but the plate so filled that it’s best split amongst at least four. Served with half a loaf of their warm toasted baguette and a liquidity sweet maple smoked mustard, the sandwich you could make from the ham would be first class. The mustard such a great touch that I even left with a jar ($6.99). Would you be surprised to hear the duck carpaccio ($14) was the lightest thing we ate that evening? The large slice of fowl so tender that even a toothless senior could plough through the dish. If only they served this before the cured ham, the duck wouldn’t haven’t been overpowered by the charcuterie’s saltiness. 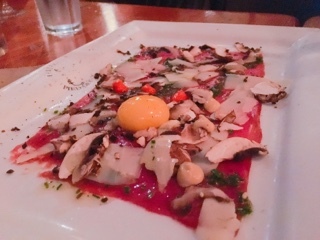 The carpaccio tasted bland, even though there was tons of differing flavours and textures from the sriracha, creamy egg yolk, and parmesan shavings. 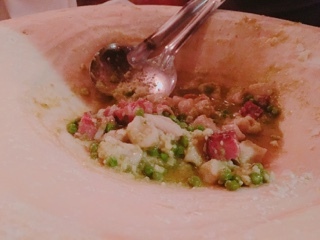 I have to give Au Pied credit for their showmanship: the hot can opened tableside with its juicy contents presented with a flourish or an entire pig’s head stuffed with lobster. You can’t help but stare at the table beside you and wonder what they ordered. 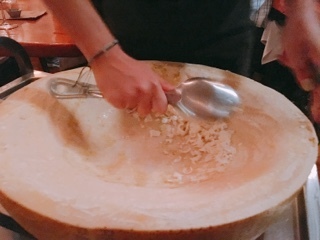 Even a simple dish of bacon gnocchi ($30) starts with a giant parmesan wheel. Oh, how the heads turn as the gigantic block of cheese is wheeled on a trolley and stops tableside. First, slices of parmesan is scrapped into the centre. 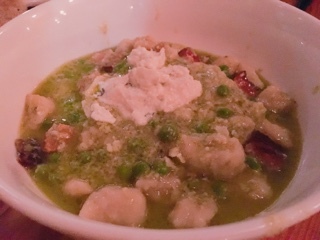 Then, a pan filled with gnocchi, huge chunks of bacon and peas is added and slowly tossed and mixed so the pasta’s heat melts the cheese. Just imagine how you’d react to the intoxicating scent. Yet, it doesn’t stop there. Afterwards, a small jug of jus is presented and you’re told that they’ll add that into the mixture so the gnocchi isn’t dry. Really, it’s an unnecessary step and renders the dish a watery mess… all that creaminess I watched them cox into the dish was ruined. Another liberal sprinkling of parmesan and a healthy dollop of fresh ricotta - the dish is finally done. After all that, it’s a shame that the gnocchi is way too salty, drowning in a pool of oily broth, and feels like you’re eating chunks of pork belly as opposed to fluffy pasta. Disappointing to taste, but man how you salivate as you watch it being prepared. Sadly, everything thereafter wasn’t any better. 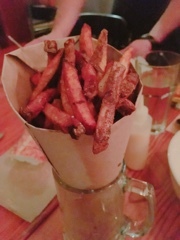 The duck fat fries ($5.75) were bordering on burnt, but somewhat salvaged by the lovely house-made aioli incorporating a great citrus twist. 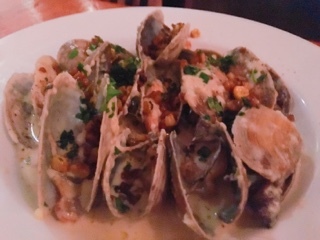 A special for the evening, the steamer clams and corn ($16), was perhaps the worst course of the dinner. The cream sauce and bacon much too heavy for clams; only to be made worse by adding maple syrup so everything’s also sweet. 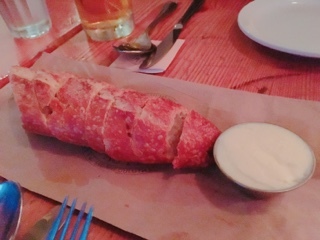 Perhaps the chef was simply trying to cover the gritty rubbery clams. Why did I order seafood at a restaurant known for meat? Despite thinking we showed restraint while ordering (to save room for dessert), our table of three could not get through everything. So, the lone sweet incorporating the popular maple syrup came in a cocktail form. The gin guay ($12.50) is a gin and tonic spiked with maple syrup and topped with champagne and soda water. The first few sips, while the cocktail was nice and cold, was tasty. But, once it warmed a tad, the drink tasted like ultra-sweet cough syrup. That’s a lesson for me: you don’t go to a place known for excess and try to drink in moderation. 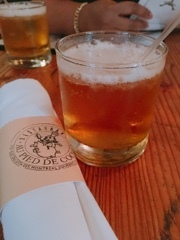 Perhaps, if I downed the gin guay and followed the cocktail with beer for the cured ham and wine throughout dinner, the tone would have changed. You need to be a little inebriated and carefree to enjoy the rich overpowering dishes. Otherwise, you’ll leave like me, and wish you merely stuck with an awesome cured ham sandwich.